Exotic Matter in its natural habitat: the black void. Exotic Matter is the driving force behind all of the actions in Ingress. 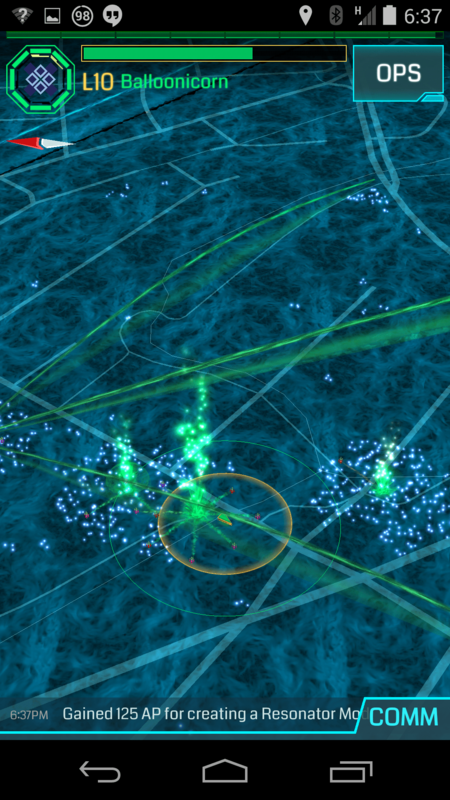 XM is your in game energy/health, every action in ingress now requires XM to complete, including hacking portals, attacking enemy portals, making links, deploying resonators, recharging resonators, deploying mods and creating fields. Without it, your scanner is disabled and you aren’t able to interact with portals. Each collection of XM consists of 3 white dots revolving around an invisible core that must be interacted with to collect it. To interact with the XM you must navigate yourself (walk to) the white xm dots ingame, and get them within range of your scanner 30 meters(within the orange circle). Each center has an energy amount ranging from 35-100 XM. XM that has been collected is repopulated throughout the game every 15 min-20 minutes. The amount of XM produced by a portal is 10% of the total XM within the portal itself. Therefore it is in your best interest to keep portals recharged. As you collect xm it will disappear on other agents scanners within 15 seconds (the time for one sync of the scanner) so it is best to stay in groups if farming an area so all agents keep charged up.